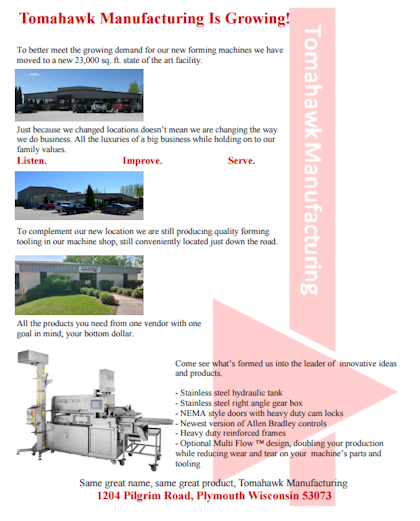 Food Forming Machine Parts - Tomahawk Mfg., Inc. - Tomahawk Mfg. Tomahawk Manufacturing…. Your source for Forming Machine Replacement Parts! Competitive Prices that beat the OEM. You will save money. Experience what others already know. Fast Service 98% of parts ship within 48 hours from our generous inventory to meet the 24/7 speed of your business. Quality better than, or equal to OEM. Why? We test our materials with independent labs to assure compliance with performance standards. Over 23 years specializing in forming parts enables us to deliver parts you can count on. Part Improvements that keep you running. Downtime is expensive, that's why Tomahawk Manufacturing works directly with our customers to develop new and improved designs that decrease downtime, improve yields, and costly changeover expenses. For example, we developed a TXL shuttle bearing that lasts in excess of a year, needs no oiling; and replaces an OEM aluminum bronze bearing that needed planned oiling and changing multiple times over a year. Imagine the savings! Friendly, Competent Service Tomahawk technical service support work seamlessly together to solve your parts problem. when you call for parts, the same knowledgeable , friendly team will help you. OEM former operators need fast, friendly service to meet the challenging demands for their business! Provide an alternative source for former spare parts, tooling and equipment that is competitively priced, responsive to needs, and understands the quality required. Get to know some of our most popular food forming machine parts designed to last longer, improve performance and keep your machines running with less downtime.